You are browsing the Blog for Slideshow. The dazzling Banggai Cardinalfish still poses a dilemma for those who follow its populations in a remote archipelago in Indonesia. Image: Colin Foord. A New Chapter for Indonesia and the Pterapogon kauderni fishery? Over the past several days, I have been reporting on the 17th meeting of the Conference of the Parties (CoP17) to the Convention on International Trade in Endangered Species of Wild Fauna and Flora (CITES). My focus has been primarily on the marine species proposed for regulation under CITES with an emphasis on the Banggai Cardinalfish, a species I have covered extensively here and elsewhere. Now that CoP17 is over, a new chapter begins for the Banggai Cardinalfish, and the following is really the beginning of that story. On Monday, the European Union withdrew its proposal to list the Banggai Cardinalfish (Pterapogon kauderni) under CITES Appendix II. The withdrawal occurred following Indonesia’s acceptance of a series of draft decisions, which are outlined below. On Tuesday, during the CoP17 plenary session, the withdrawal and the draft decisions were officially adopted (see video above), beginning another chance for Indonesia (and the aquarium trade) to put in place effective reforms for conservation and sustainable harvest of the species. Species included on Appendix II are those that, although currently not threatened with extinction, may become so without trade controls. 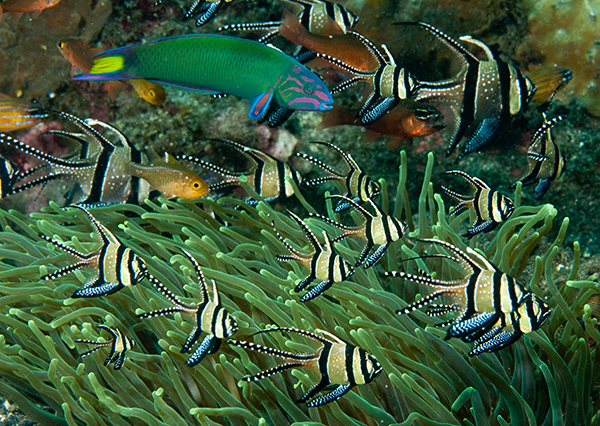 The inclusion of the Banggai Cardinalfish on Appendix II was supported by the CITES Secretariat, as well as the Food and Agriculture Organization of the United Nations (FAO), the United States and numerous other Parties, NGOs and observers who believe the Banggai Cardinalfish meets the criteria for inclusion. CITES is the Convention on International Trade in Endangered Species of Wild Fauna and Flora and organisms listed are subject to many trade and possession restrictions. A listing for the Banggai Cardinalfish could have led to a ban on its import into the EU. Of the 62 proposals considered at CoP17, only six, including the proposal to include the Banggai Cardinalfish, were withdrawn. 17.X1 Indonesia should implement conservation and management measures to ensure the sustainability of international trade in Pterapogon kauderni, and report progress on these measures to the Animals Committee at its 30th meeting (possibly in mid-2018). 17.X2 Subject to external funding, the Secretariat shall commission a study to assess the impact of international trade on the conservation status of Pterapogon kauderni and to advise on suitable conservation and management measures, as appropriate. 17.X3 The Secretariat shall share the results of the study as referred to under decision 17.X2 with the Animals Committee at its 30th meeting. 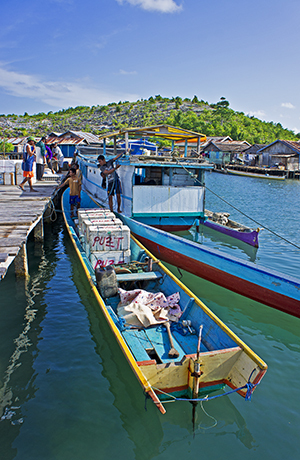 Fishing dock in the Banggai Islands where the Indonesian government has struggled to enforce fishery regulations. Image: Ret Talbot. 17.X4 The Animals Committee shall, at its 30th meeting, review the progress report submitted by Indonesia as referred to under Decision 17.X1, as well as the results of the study as referred to under Decision 17.X2, and make its recommendations to the 18th meeting of the Conference of the Parties. 17.X5 Donor Parties and other relevant organizations, including FAO, are invited and encouraged to provide support to Indonesia and to the Secretariat for the purpose of implementing Decisions 17.X1 to 17.X3. The 30th meeting of the CITES Animals Committee will likely be held during the spring or summer of 2018. The role of the Animals Committee is to provide technical support to decision-making regarding species of animals that are subject to CITES trade controls. The members of the Animals Committee represent the six major geographical regions (Africa, Asia, Europe, North America, Central and South America and the Caribbean, and Oceania) as well as one specialist on nomenclature. Members are elected at the CoP, with the number of regional representatives weighted according to the number of member nations or “parties” within each region and according to the regional distribution of biodiversity. COP18 will be held in 2019 in Sri Lanka. In a statement posted to its Facebook page, OFI praised the EU’s decision to withdraw its proposal to include the Banggai Cardinalfish on Appendix II and instead to propose the draft decisions listed above. OFI…wholeheartedly supports the agreement that was adopted yesterday; to give Indonesia the possibility to implement conservation and management measures, with the support of the CITES Secretariat, Parties and organisations, including the FAO, in the time leading up to the 30th meeting of the CITES Animals Committee. It should be noted that many in favor of the withdrawal also note the precarious nature of the species’ conservation status and even acknowledge, as the FAO does, that it meets the criteria for inclusion on Appendix II. Nonetheless, they feel a listing was not the right path forward and that the draft decisions listed above are a much better outcome than forcing a CITES listing on the only range country despite its strenuous opposition. 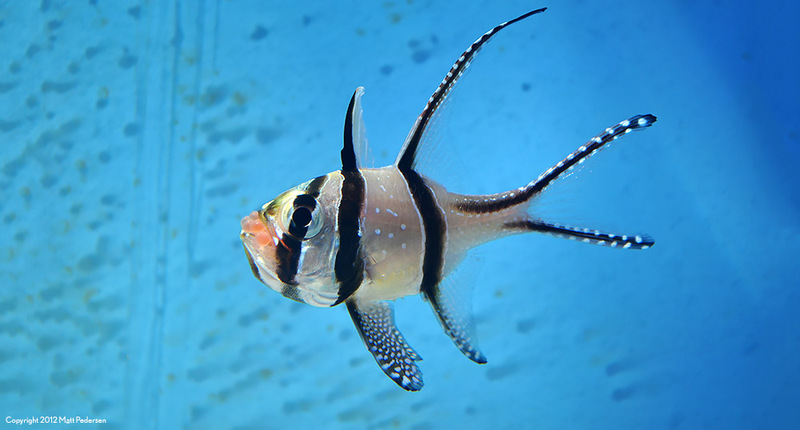 Wild Pterapogon kauderni: Aquarists now can choose between captive bred and wild-collected Banggai Cardinalfish, the latter usually a lower prices. Image: Shutterstock. Not everyone was as optimistic though. “I would say that the fact that in eight years there has not been significant improvements to stocks makes me wonder about the ability for us to help this species recover [without a CITES listing],” says Michael Tlusty of the New England Aquarium in Boston. Tlusty’s project to better monitor the aquarium trade is a winner in this year’s Wildlife Tech Challenge. “Are we preserving the status quo, or will the call for more effort and data to understand this species actually move the needle towards improvement?” Tlusty’s concerns are concerns that were also expressed by the US delegate in support of the EU proposal to grant the Banggai Cardinalfish CITES protection. As the US delegate made clear prior to the EU withdrawing its proposal, Indonesia’s efforts to better manage the species to date have proven largely ineffective. While they may differ in their degree of optimism, both Fosså and Tlusty are hopeful that the draft decisions put in place at CoP14 will indeed move the needle in terms of the conservation status of the species. Although we likely won’t know the results until the Animals Committee reviews the progress report submitted by Indonesia, as well as the results of the study commissioned by the Secretariat regarding the conservation status of the species, there is some comfort in the fact that there is now at least an international framework with set deadlines in place. Perhaps it will insure that we don’t see a hat trick at CoP18 insofar as withdrawals of Banggai Cardinalfish proposals are concerned. CORRECTION: An earlier draft of this entry said Svein A. Fosså sits on the Animals Committee. Fosså is an observer in Animals Committee meetings, but not a formal member. He intends to be present at AC30. In late September, just days before CITES CoP17 (Conference of Parties Meeting 17) got underway, we shared the proposals to list 4 aquarium-related species under the convention. Listings, and the appendix a species is listed within, can have wide-ranging trade implications, from simply applying trade reporting requirements to outright bans on trade. 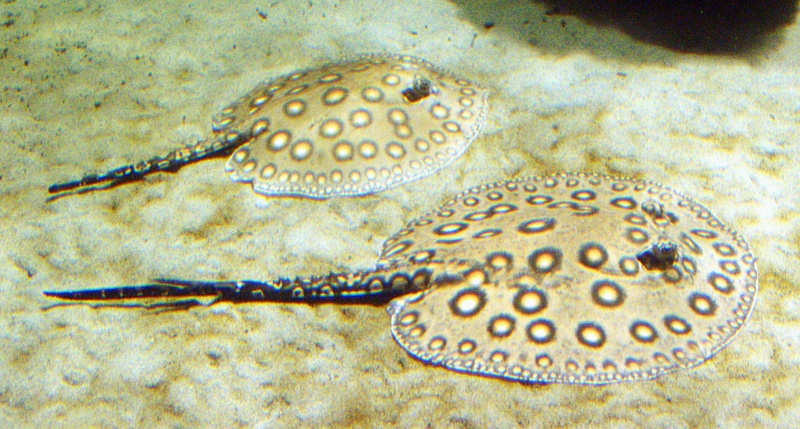 The CoP17 decisions are in, and will affect every aquarium-related group or species that had been up for discussion. Decided: The proposal was “Withdrawn. Instead five draft decisions, contained in CoP17 Com. I. 32 were agreed by consensus. [Rec.14].” We’ll share more on this story in a follow-up from Ret Talbot. This means that starting Monday, January 2, 2017, international trade in Potamotrygon spp. will require either an export permit or certificate of origin when being imported. 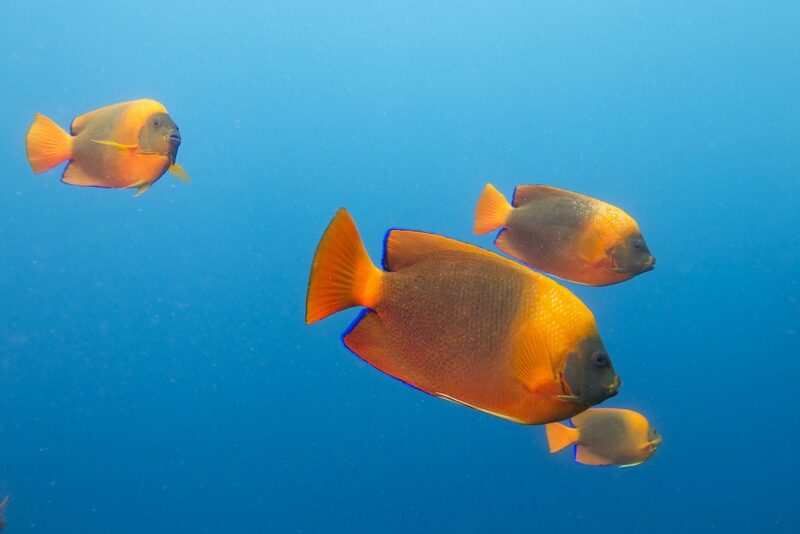 Meanwhile, trade in the Clarion Angelfish, whether captive-bred in Indonesia or wild-caught in Mexico, will require CITES permits akin to those currently required to trade in all stony corals and wild seahorses; the same will become true for Nautilids. CITES Setting Aside Science, Preferring Sentiment? Svein A. Fosså attended CoP17 as as an observer for Ornamental Fish International (OFI), and has attended all CoPs and most Animals Committee meetings since CoP11 in 2000. Reporting as-it-happened to friends and associates via social media, Fosså shared concerns about the process of listings and the way CITES decisions were made this year. “Yesterday’s long working day ended in a hectic night session where several listing proposals were pushed through in very little time, with next to no debate and zero possibility for NGOs to [comment] on most issues. “Reptile keepers and traders have had a very bad CoP with lots of listings that hardly meet any scientific listing criteria, and where CITES is unlikely to give any conservation benefits whatsoever. The plentiful animal rights lobbyists had the more reason to rejoice, with their [loud] cheers resounding in the hall every time a new species was banned from trade,” lamented Fosså. 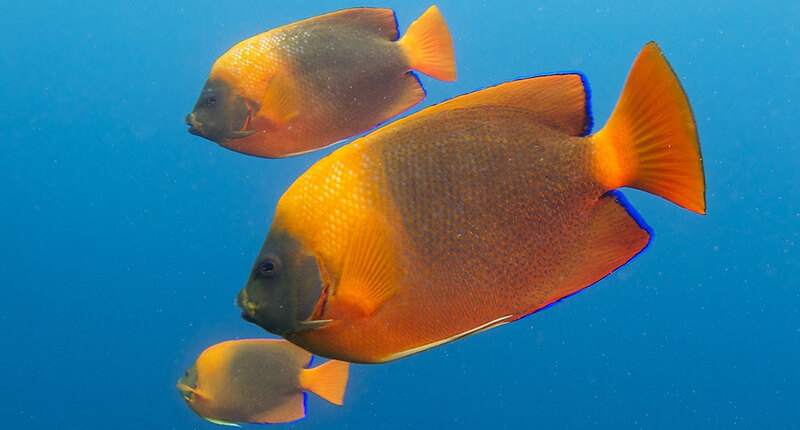 Large-scale cultivation of the Clarion Angelfish by Bali Aquarich could prove an interesting wrinkle for trade regulation, considering that Mexico (which proposed the Appendix II listing) is the source country for wild Clarion Angelfishes. Image courtesy Bali Aquarich. 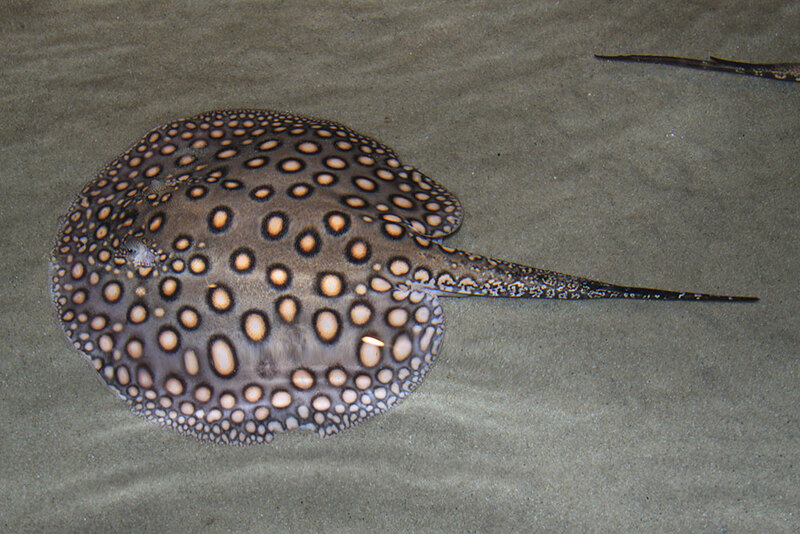 Nautilids and Banggais – CITES Got It Right? The decision to list Nautilids under Appendix II seems to have wide-ranging support. The Center for Biological Diversity issued a press release supporting the decision, and Fosså noted that OFI was ready to “actively support the proposal to list the Nautilidae in [Appendix II],” but again there was no opportunity to officially comment. 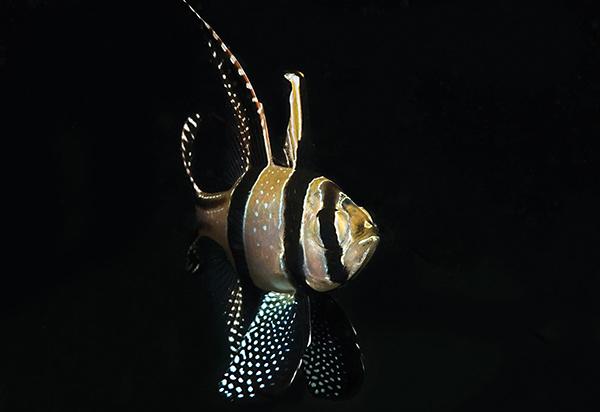 OFI also released an official statement in support of the ultimate Banggai Cardinalfish compromise, which the UK’s Ornamental Aquatic Trade Association (OATA) quickly endorsed. “The situation for the Banggai Cardinal Fish has been of major concern to OFI for many years, although not necessarily for the same reasons as suggested by CITES CoP17 prop. 46. We are dealing with a species with a very restricted distribution, exposed to a multitude of threats. 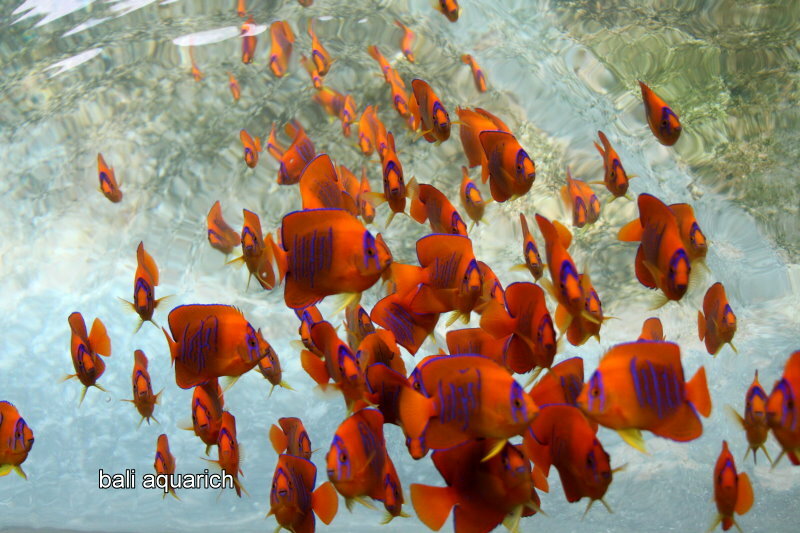 In addition to the collection for the ornamental fish trade, which has shown a decreasing trend in later years, these threats include destruction of the macro and micro habitats, due to destructive fishing methods for food fish and selective targeting of the host sea anemones and sea urchins. Use as feeder fish in mariculture of food fish has been reported to be an added threat. “Because of the complexity of the threat factors for the species, we could not agree to CITES Appendix II listing being an effective tool for protecting the species. Through the unfortunate experience with the listing of the seahorses 14 years ago, we are in no doubt that Indonesia with a listing of the Banggai Cardinal Fish most likely would loose much or possibly even all of their trade to breeding operations in non-range countries; and that most likely with very little or no benefit whatsoever to the wild populations in the Banggai Archipelago. It could also not be ruled out that a listing would have an overall negative effect on the conservation of the species. We encourage you to read Ret Talbot’s more detailed examination of the Banggai Plan enacted at CoP17, and three years from now, we hope to report back on the results of this plan as required to occur at CITES CoP18. 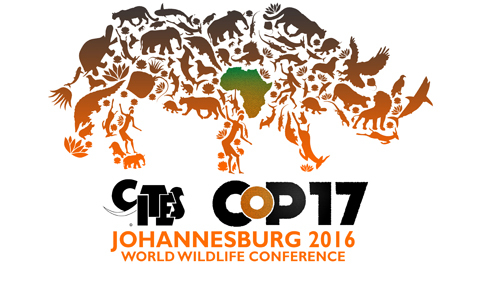 CITES CoP17, Johannesburg, South Africa, starts tomorrow. This is the 17th Conference of Parties meeting to be held, a meeting which has been held roughly every 2-3 years since the first CoP in 1976. CoP meetings are the time when changes to CITES listings for species are discussed and debated, culminating in the adoption of additions and revisions to the CITES appendices. If listed, a species becomes difficult to trade without special permissions and paperwork and may be banned completely from sale into the European Union (EU). 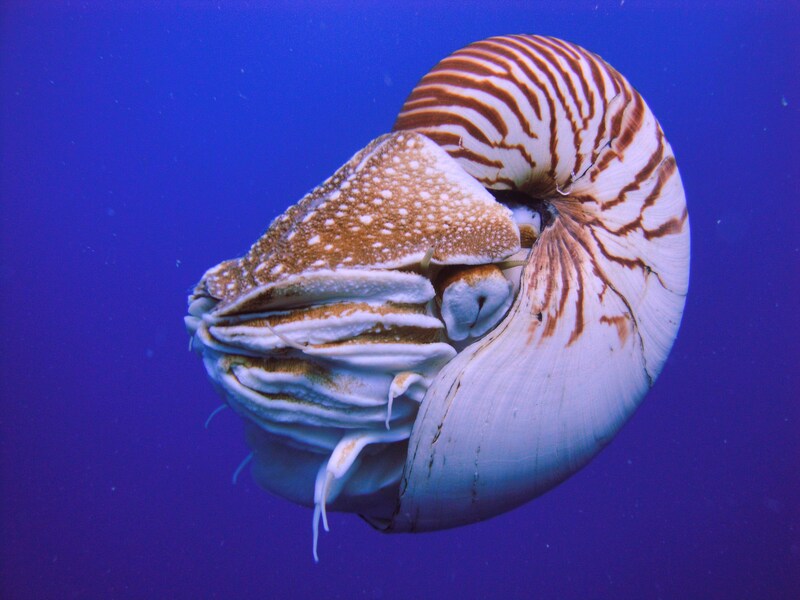 The CITES Secretariat’s recommendations include support for the listing of all nautiloids in Appendix II. This will likely have little impact on the aquarium trade in the species, which appears to be extremely limited. 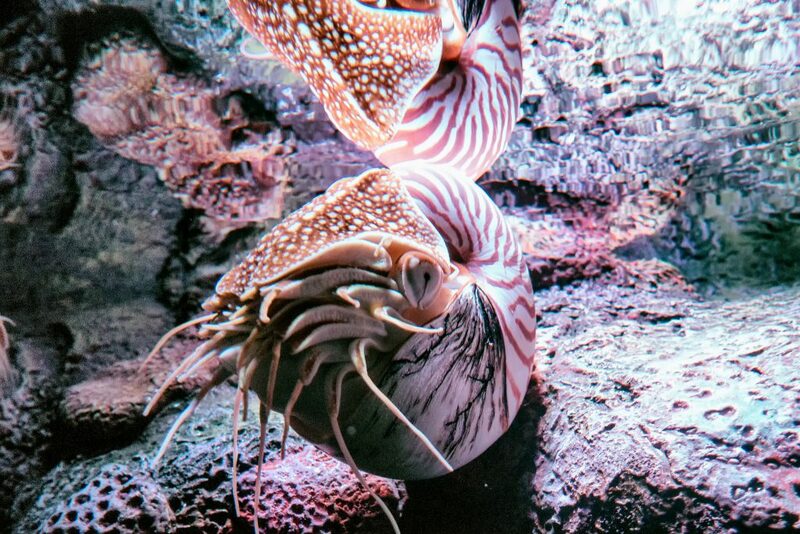 A listing of nautiloids will likely have little impact on the aquarium trade in the various species, which appears to be extremely limited based on information from AquariumTradeData.org, with never more than 200 Nautilus spp. being imported to the US in a given year, and usually significantly less. 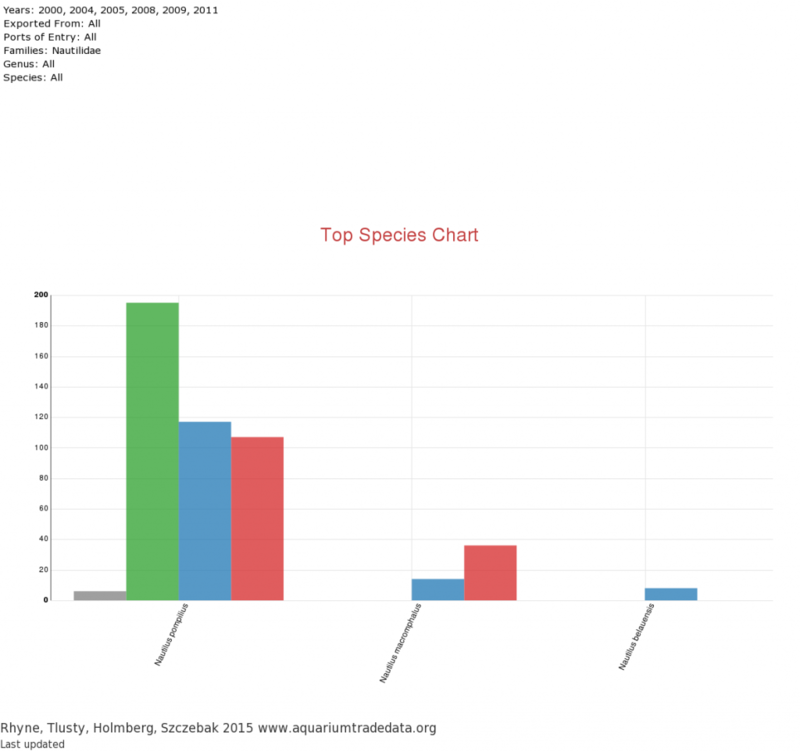 US import data on all nautiloid species from AquariumTradeData.org. Key: Gray = 2000, Green = 2008, Blue = 2009, Red = 2011. It is the consideration of the the Banggai Cardinalfish for Appendix II listing that perhaps will garner the most attention from the aquarists, and this proposal currently has a recommendation to approve coming from the CITES Secretariat (it should be noted that the Secretariat’s recommendations are just that; they are not binding decisions already set). For any reader unfamiliar with CITES, the Convention on International Trade in Endangered Species of Wild Fauna and Flora, CITES.org includes a detailed introduction for review. This international agreement is currently voluntarily adhered to by 183 countries. CITES listings already play a role in the international trade of several groups of species traded for aquarium purposes, perhaps most notably including many corals and all seahorses. Listings of a species, genus or family under CITES Appendices I, II or III, has various trade ramifications. Appendix I species essentially being off limits, Appendix II species having their trade controlled, and Appendix III with more minimal trade documentation requirements than Appendix II (view detailed explanations of Appendices on the CITES website). 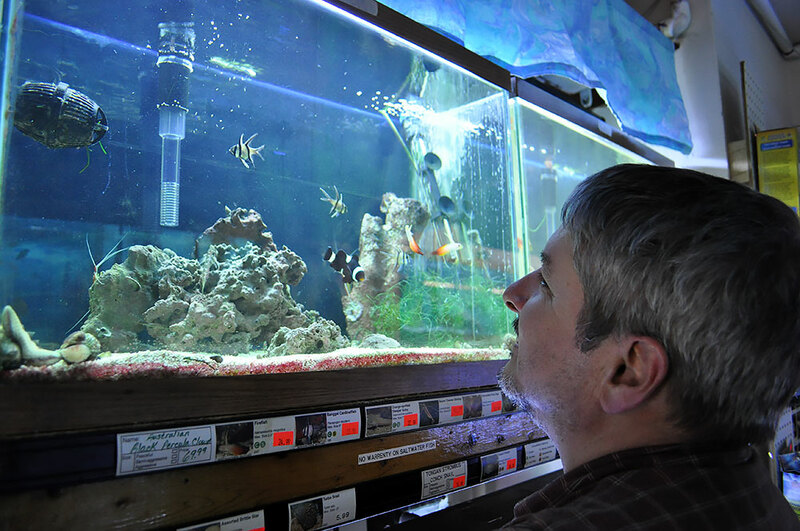 John Kamp at World of Fish in Duluth, MN, inspecting recently arrived Banggai Cardinalfish. The species remains a perennial favorite, generally in the top-10 species imported into the US. The Banggai Cardinalfish was first proposed for CITES listing in Appendix II by the United States during CoP14, at the Hauge, Netherlands, in 2007. Just a few months prior, the Banggai Cardinalfish had been listed on the IUCN Red List as an Endangered Species, where it remains at this time (it’s noteworthy that the Red List does not have any effect on trade in a species). The proposal to list the Banggai under CITES in 2007 ultimately failed. Since that time, the trade in wild Banggai Cardinalfish has continued, although since roughly 2013, it appears that in some markets, captive-bred Banggai Cardinalfish produce by large scale operations in Asia have potentially overtaken the bulk of the trade volume in the species. After review in 2015, at the start of 2016, the Banggai Cardinalfish was listed within the US under the Endangered Species Act (ESA) as Threatened, with the Final Rule becoming effective February 19th, 2016. A male Pterapogon kauderni holding a clutch of freshly spawned eggs in his mouth; this popular species is known for their paternal mouthbrooding behavior. With this latest proposal to list the Banggai under CITES, once again the debate over aquarium fisheries and the aquarium trade comes to the forefront, and not everyone is in agreement. 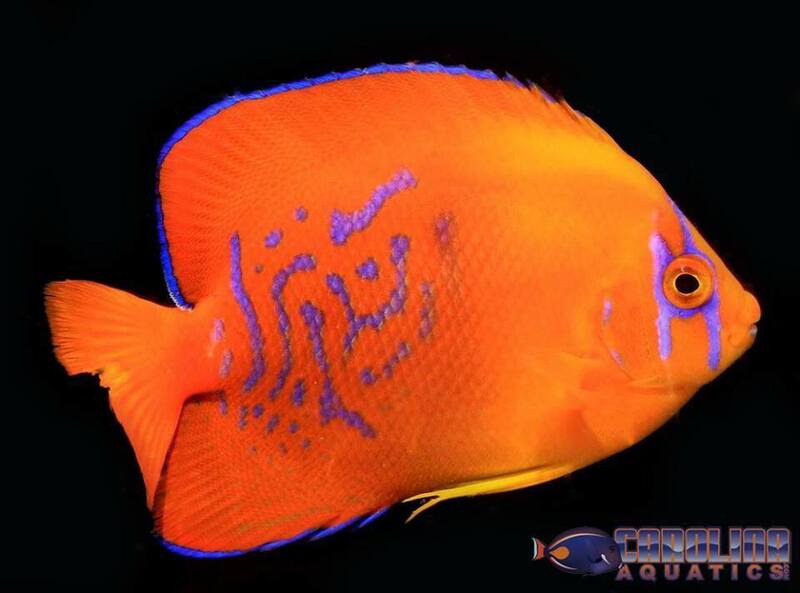 OATA, the Ornamental Aquatic Trade Association, is the organization representing the aquarium trade in the UK. OATA issued a position statement in opposition to the EU’s proposal to list the Banggai under Appendix II. Dr. Andrew Rhyne, a leading aquarium trade and aquaculture researcher and author of the paper Is sustainable exploitation of coral reefs possible? A view from the standpoint of the marine aquarium trade, differs in his opinion. CoP17 runs through October 5th, so within the next two weeks, we’ll know which species and groups, if any, obtain new protections under CITES. 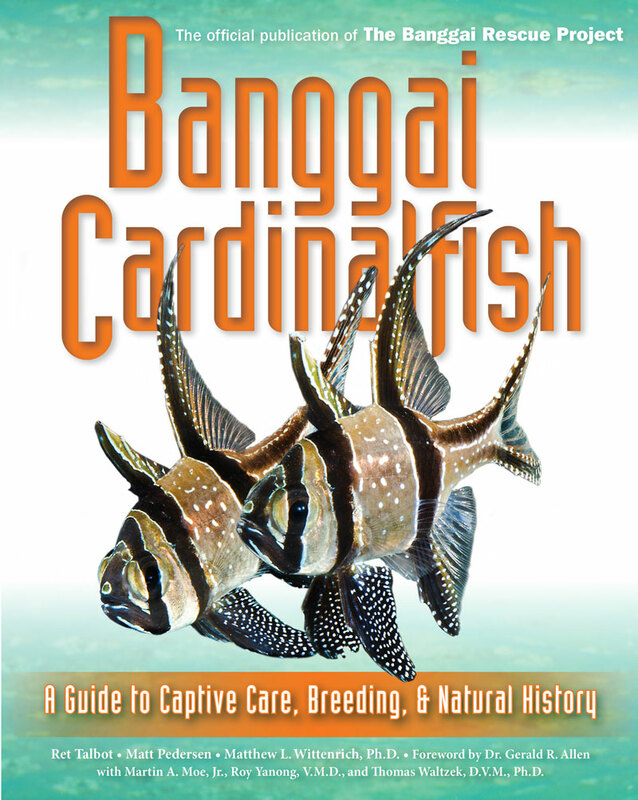 For an in-depth look at the plight of the Banggai Cardinalfish, a limited number of copies of the highly praised book, Banggai Cardinalfish, the publication of the Banggai Rescue Project, are still available. Talbot, Ret. Pedersen, M. and Wittenrich, M. (2013). Banggai Cardinalfish: A Guide to Captive Care, Breeding & Natural History hardcover ed. Available from Amazon and aquarium booksellers. Banggai Cardinalfish, the book from Ret Talbot, Matt Pedersen and Dr. Matthew L. Wittenrich, investigating the past, present and future of this iconic and troubled aquarium fish. Dealers: Contact Julian Sprung at Two Little Fishies for wholesale quantities. Vagelli, A. 2001. The Banggai Cardinalfish: Natural History, Conservation, and Culture of Pterapogon kauderni. Wiley-Blackwell. Available from Amazon.